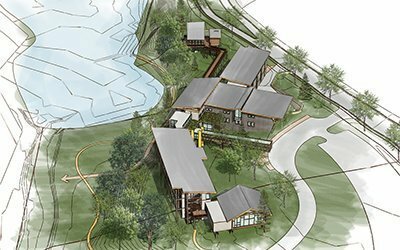 CJMW is designing a new home for BB&T’s Leadership Institute. The Institute provides leadership development programs for corporate executives, business owners, BB&T management and clients, and education leaders from throughout the country. The 58,000 square foot center will be built in Greensboro, near BB&T’s Triad Corporate Center. 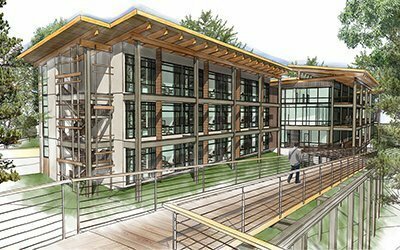 The design takes its inspiration from the heavily wooded site overlooking a 7-acre pond, and from the mission and program of the Institute itself, which focuses on exploration and self-discovery. To take advantage of the terrain and maximize views, the center takes the form of a series of connected spaces, following the natural curve of the land. The extensive use of glass and an open floor plan bring the outdoors inside, allowing guests to connect with the scenic surroundings. The atmosphere is relaxing and comfortable. A wide range of spaces from private to open and public allow participants to join the group conversation or reflect in silence. The three-level facility will include meeting spaces, 48 guest rooms, and space for staff offices. A tree house, connected to the main building by a catwalk, is an event, meeting, or place to enjoy nature and the view. CJMW is providing architectural and interior design services, with teams led by firm principals Jeff Sowers and Kathleen Warner. The Institute expects to begin operating in the new facility in early 2018.